This was a very long weekend of work, but it was jammed with information. 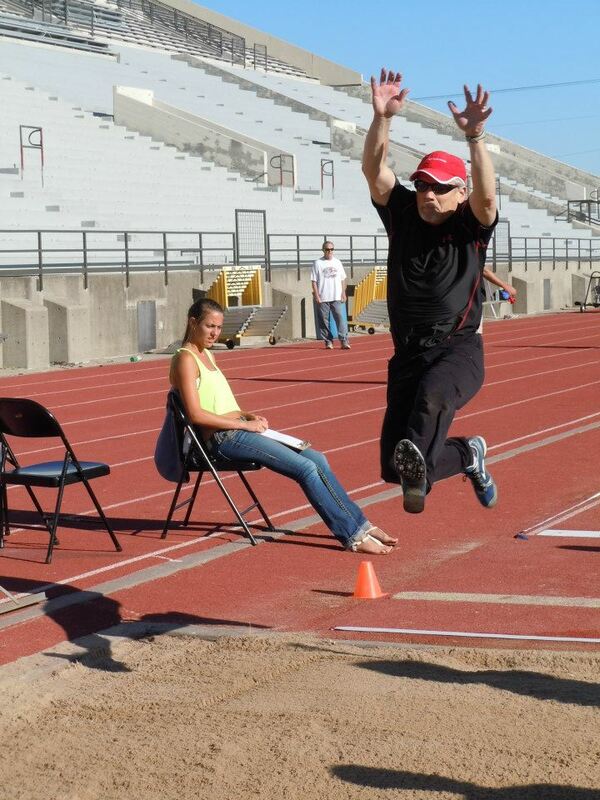 I’ve been involved in track and field for over 40 years, and I learned things I didn’t know I didn’t know. It was a fantastic use of time. Friday we began with coaching philosophy, ethics, and risk management. No one who works with others today can fail to understand the importance of doing things the right way, all the time. Coaches are like teachers, in positions of authority and care. You have to know your legal and professional obligations. So we spent some time talking about the standards of care that coaches must exercise. After that, we had a session on training theory. While most of us had some knowledge of this, our instructor took us through a comprehensive explanation of the principles of periodization, adaptation, overload, and recovery. I found Coach Mike Judge’s presentation to be enlightening. We ended around 9 p.m.
Saturday, scheduled from 8:30 a.m. to 9:30 p.m., started with physiology. We covered topics as diverse as the role of ATP and the uses of stretch-shortening cycle. From there we went to biomechanics, or, in other words, we went from biology to the physics of human motion. I have a background in some of this, but even for me it was challenging. Coach Loren Seagrave handled this part, with enthusiasm and clarity. As he did for the running events. On Saturday afternoon, we got the sprints, hurdles, and relays. As you might expect, the emphasis was on speed development, and how biomechanics can inhibit or enable speed. Coach Seagrave was thorough. My neighbor to my left, a jumps coach, looked a little dazed by the end. In the evening, Coach Neil Young covered the jumps. Understand: we had been there more than 10 hours by then, so it was going to be a test for him to keep us engaged through long and triple jumps, high jump, and pole vault. With humor and demonstration, he kept us engaged through some fairly technical matter (such as how to calculate your step pattern, step number, and angle for the high jump). Good stuff. We returned Sunday for Coach Judge and a morning dedicated to the throws. If anyone was a coach who just says, “let it rip,” he got a major lesson in the biomechanics and physics of efficient throwing. As someone who throws himself, without having any coaching, I’m pretty sure Coach Judge just put points on my pentathlon total. It was totally focused, yet still interactive and fun. After lunch, or rather instead of lunch (since we wanted to get out an hour early), Coach Seagrave returned for sessions on sport psychology, the distance events, and racewalking. By the last two hours, our cohort was a little restless, a little rowdy, and in the mood to ask a lot (a LOT) of questions. Coach Seagrave did a really good job of letting some of the steam out, but keeping the lid on the classroom. We finished on time and with everyone, I think, satisfied. At least I am. What follows now is a 160-question exam. I have 90 days to take it online, and have to get 80% of the answers right. We received a big book for coaches, which I’ll study, and I’ll review my notes (which run to 24 handwritten pages). If you ask me, was it worth it? Even before the exam, I can say, unequivocally, yes! Update: I passed the exam with 92% correct! CERTIFIED!